The location was at National Harbor in Maryland on one of the many brick paved walkways. The "Take It!" was an easy decision but very difficult in the doing. The After Take: This shot was actually a retake after showing the first set of takes from the previous day to my set of reviewers for whom I am eternally grateful. They are committed to candor and in this instance helped to spare me from what was a photo disaster. In the first photo shoot, here is what happened. It was a little later in the day, thus the shadow cast was a little bit longer. Well this had me with long legs for the first time in my life. All the quotes about casting a long shadow were coming to mind and a flattering write up getting formulated in my mind. Well, as was pointed out to me, when shadows get long, the distortions can go both ways. What is big or long in the bottom can be short and small at the other end, in this case at the top. The comment that saved us all was "look at the long legged pin head." Talk about being brought down to earth quick! 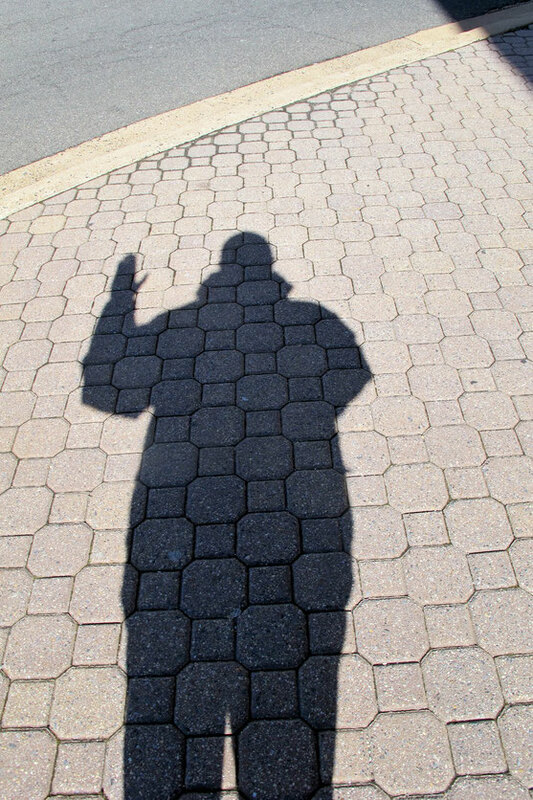 So having been humbled in such a profound way, I submit my shadow hello to you. I do so in suggesting that this is a shot that you can look to make for yourself for I believe it is lots of fun. Please be careful to give yourself a shadow that is proportional enough to enable you to avoid any new nicknames. I have to stop now as I am totally stuffed from eating humble pie. Thanks for joining me as I try to keep on with the "Walking the Walk" part of keeping this in the real. This photo gave me a good crack up.